Hexadecyl-immobilized porous cellulose beads (HICBs) can be used to remove β2-microglobulin, as well as several inflammatory cytokines and free protein-binding uremic toxins (PBUTs). Interleukin-6 and PBUT levels have been associated with oxidative stress and/or cardiovascular disease. In this retrospective study, we investigated the potential of direct hemoperfusion with HICBs to improve impaired myocardial fatty acid imaging in hemodialysis patients. We evaluated 24 hemodialysis patients who did not undergo percutaneous coronary intervention or coronary artery bypass grafting during the observation period. Among these patients, 12 who had been treated using HICB columns for more than 4 years were assigned to the HICBs group (mean observation period, 61.9 ± 16.3 months), while the remaining patients who had never undergone treatment with HICB columns were assigned to the non-HICBs group (mean observation period, 58.0 ± 12.2 months). Impaired myocardial fatty acid metabolism was assessed by single-photon emission computed tomography (SPECT) using 123I-β-ethyliodophenyl pentadecanoic acid (BMIPP). Uptake on SPECT was graded in 17 segments on a 5-point scale (0, normal; 4, absent) and assessed as the BMIPP summed score (SS). While the HICBs group showed a lower mean β2-MG than the non-HICBs group, the other baseline clinical patient characteristics did not differ between the two groups. In the HICBs group, the second BMIPP SS was decreased significantly compared with the first BMIPP SS. A decrease in the BMIPP SS was observed in nine (75%) patients with the first BMIPP SS ≥ 6, and no change was observed in three patients with BMIPP SS ≤ 2. In the non-HICBs group, the second BMIPP SS was increased significantly compared with the first BMIPP SS. The improvement in myocardial fatty acid imaging suggests an improvement in the impaired myocardial microcirculation. 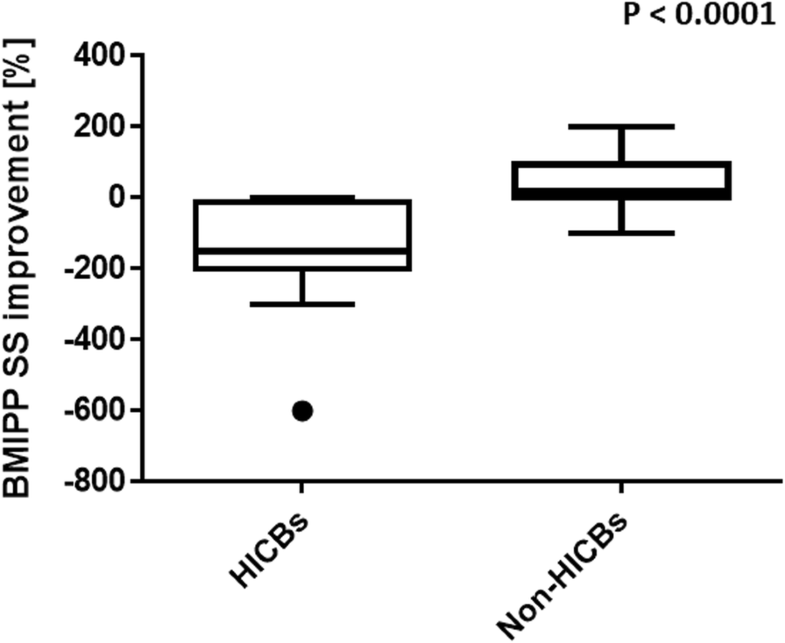 We suggest that the use of direct hemoperfusion with HICBs may have improved the impaired myocardial microcirculation in hemodialysis patient through the removal of protein-bound toxins and inflammatory cytokines and might contribute towards improving the survival of dialysis patients. Hexadecyl-immobilized porous cellulose beads (HICBs), with an appropriate pore size and a mean diameter of 460 mm and contained within a column (Lixelle; Kaneka Medix Co), were originally designed to selectively adsorb β2-microglobulin (β2-MG) through hydrophobic interactions . Several reports have suggested that in addition to β2-MG, the Lixelle column also removes several inflammatory cytokines and free protein-binding uremic toxins (PBUTs) [2, 3]. Dialysis patients are in a chronic, persistently activated inflammatory state, as demonstrated by both elevated inflammatory markers and proinflammatory cytokines, such as interleukin-6 (IL-6) . Recently, IL-6 levels have been found to correlate significantly with both total and cardiovascular mortality in hemodialysis patients . Furthermore, PBUTs also accumulate in hemodialysis patients, and high circulating levels of these toxins have been associated with chronic kidney disease-related complications, including cardiovascular disease [6, 7]. Cardiac deaths account for the high mortality of hemodialysis patients . We have shown that impaired myocardial fatty acid metabolism, as assessed by single-photon emission computed tomography (SPECT) using 123I-β-methyliodophenyl pentadecanoic acid (BMIPP), is likely to be associated with cardiac death in hemodialysis patients [9–12]. This predictive potential of BMIPP SPECT for cardiac death in hemodialysis patients has further been corroborated in a multicenter cohort study in Japan (B-SAFE) . In this retrospective study, we investigated the potential of direct hemoperfusion with HICBs to improve the impaired myocardial fatty acid imaging in hemodialysis patients. The eligibility criteria for enrollment in this study were as follows: (1) patients on dialysis for 10 years or more and (2) at least 3 years between the first and second BMIPP SPECT (observation period). One hundred sixty-seven hemodialysis patients in the Toujinkai group met the eligibility criteria between April 1, 2010, and December 31, 2017. Among these patients, 22 who had been treated with HICB columns for more than 4 years were assigned to the HICBs group, and 145 patients who had never undergone treatment with HICB columns were assigned to the non-HICBs group. Through the application of the propensity score matching method, 44 patients were pair-matched (in each group). After exclusion of those patients who had undergone either percutaneous coronary intervention or coronary artery bypass grafting during the observation period, 12 patients remained in each group. Patients with BMIPP summed score (SS) of 6 or more had undergone coronary angiography, and those without significant coronary lesions were included in the study. The study was approved by the Ethics Committee for Human Research of Toujinkai Hospital. The medical records for each patient were only used. The information was anonymized for each patient so that individuals could not be identified from the medical records. The study was performed in accordance with the principles of the Declaration of Helsinki and was registered as a University Hospital Medical Information Network Clinical Trials Registry (UMIN-CTR) Clinical Trial (unique trial number: UMIN000033778) on September 1, 2018 (UMIN-CTR URL: http://www.umin.ac.jp/ctr/index.htm). BMIPP SPECT was performed by screening for ischemic heart disease. All patients underwent resting 123I-BMIPP SPECT after fasting for over 6 h on a midweek, non-dialysis day. The images were divided into 17 segments for semiquantitative analysis, according to the standard myocardial segmentation for tomographic heart imaging established by the American Heart Association. The amount of radioactivity taken up by each segment was graded visually and assigned an uptake score of either 0 (normal), 1 (mildly reduced), 2 (moderately reduced), 3 (severely reduced), or 4 (none). The BMIPP SPECT scores for 17 myocardial segments were designated as the BMIPP summed score (SS). BMIPP SS improvement (%) was calculated as follows: ([BMIPP SS at second BMIPP SPECT − BMIPP SS at first BMIPP SPECT]/BMIPP SS at first BMIPP SPECT) × 100. The HICBs group was treated using the Lixelle S-15 column containing HICBs for direct hemoperfusion in addition to their regular hemodialysis treatment. The column was placed in combination with a dialyzer downstream from the Lixelle S-15 via a separate connection tube. Blood samples (10 ml) were collected at the time of hemodialysis every 2 weeks to measure the routine biochemical factors (hemoglobin, urea nitrogen, creatinine, calcium, inorganic phosphorus, albumin, β2-MG, C-reactive protein, and intact parathyroid hormone were determined). The average value from each observation period was used for the biochemical and hematological data. The single-pool Kt/Vurea, the normalized protein catabolism rate, and the creatinine generation rate were calculated using the formula of Shinzato et al. [14, 15]. The Geriatric Nutritional Risk Index was calculated as follows: [1.489 × albumin (g/dL)] + [41.7 × (body weight/ideal body weight)] . The ideal body weight was defined as the value calculated from the height and a body mass index of 22 . Normally distributed values were expressed as mean ± standard deviation, while the other values were expressed as the median and interquartile range. We compared either the mean or median of continuous variables using the Student t test or Mann-Whitney U test. Categorical data were analyzed using the χ2 test. BMIPP SS values for the first and second BMIPP SPECT were compared using the Wilcoxon signed-rank test. The improvement in BMIPP SS between the HICBs and the non-HICBs groups was compared using the Mann-Whitney U test. p values < 0.05 were considered significant. All statistical analyses were performed with GraphPad Prism software version 6.05. While the HICBs group showed a lower mean β2-MG than the non-HICBs group, the other baseline clinical patient characteristics did not differ between the two groups (Table 1). 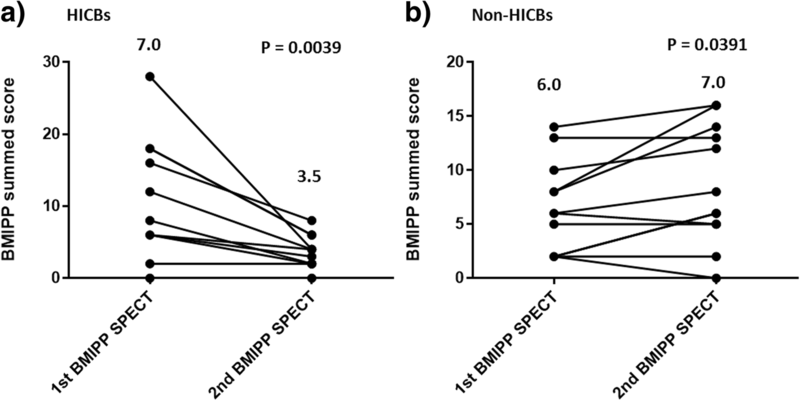 In the HICBs group, the second BMIPP SS decreased significantly compared with the first BMIPP SS (Fig. 1). Decreases in the BMIPP SS were observed in nine (75%) patients with a first BMIPP SS of ≥ 6, and no changes were observed in three patients with BMIPP SS ≤ 2. In the non-HICBs group, the second BMIPP SS was increased significantly compared with the first BMIPP SS. The BMIPP improvement was significant in the HICBs group (− 66.7%) compared with the non-HICBs group (17.1%) (Fig. 2). Figure 3 shows the representative BMIPP SPECT images of the participant treated with the HICB column. Impaired fatty acid metabolism and the consequent accumulation of acyl CoA are the characteristics of renal failure . In our previous study, we reported that the improvement of impaired myocardial fatty acid metabolism reduced the risk of cardiac death in hemodialysis patients who did not have obstructive coronary artery disease . In the present study, we investigated the potential of direct hemoperfusion with HICBs to improve impaired myocardial fatty acid imaging in hemodialysis patients. As a result, BMIPP SS decreased significantly in the HICBs group but increased significantly in the non-HICBs group after about 5 years. Furthermore, the changes in BMIPP SS showed improvements in the HICBs group compared with that in the non-HICBs group. These novel results suggest that the long-term use of a HICB column may improve the myocardial fatty acid metabolism in hemodialysis patients. In hemodialysis patients, myocardial fatty acid metabolism tends to impair myocardial fatty acid imaging, even in the absence of obstructive coronary lesions . One of the main factors of impairing the myocardial fatty acid metabolism is considered to be a reduction in the myocardial blood supply due to the disorder(s) in the myocardial microcirculation . In pathological studies, the unique findings of intramyocardial arteriolar thickening, reduced capillary density, and myocardial fibrosis of the heart have been observed in hemodialysis patients [19–21]. These myocardial abnormalities can lead to myocardial microcirculatory disturbances. The presence of these pathologies in hemodialysis patients indicates that myocardial cells are more susceptible to reduced myocardial blood supply than in non-dialysis patients and likely contribute to the impairment in myocardial fatty acid metabolism. Many studies have reported that oxidative stress is one of the risk factors that plays an important role in the myocardial microcirculation. Kaufmann et al. reported that the noxious prooxidant effects of smoking extend beyond the epicardial arteries to the coronary microcirculation and affect the regulation of myocardial blood flow. Basili et al. implicated oxidative stress in poor myocardial microcirculation after percutaneous coronary intervention. They also reported that impaired myocardial microcirculation was improved by vitamin C administration [22, 23]. Furthermore, previous studies have suggested that oxidative stress, mediated by the oxidase activity of nicotinamide adenine dinucleotide phosphate (NADPH), may be involved in the cardiac dysfunction caused by hypertension, diabetes, obesity, cytokines, and aging [24–27]. HICBs adsorb free protein-bound uremic toxins (e.g., free indoxyl sulfate (IS) and free p-cresyl sulfate (PCS)) that are involved in oxidative stress . IS has been shown to induce the production of reactive oxygen species in vitro [28–30]. In addition, it has been reported that IS strongly decreases the total glutathione levels, which is the most active non-enzymatic antioxidant in endothelial cells . Han et al. reported that the cardiac toxicity of PCS is at least partly attributable to induced NADPH oxidase activity and the production of reactive oxygen species that facilitate cardiac apoptosis and results in diastolic dysfunction. In the present study, since we did not measure the concentration of PBUTs in the blood, its changes could not be reported. However, the combination treatment of HICB column and diffusion with direct hemoperfusion and hemodialysis may be able to maintain lower serum PBUT level. HICBs also adsorb inflammatory cytokines, such as IL-6 . Recently, Danesh et al. prospectively evaluated two large population-based cohorts and, in a systematic review, demonstrated associations between long-term circulating IL-6 levels with fatal and non-fatal coronary heart disease (CHD) risk. They concluded that long-term elevations of IL-6 are associated with CHD risk to a similar level as some of the major established risk factors. In addition, Aker et al. suggested that the IL6 G-174C polymorphism is associated with both mortality and cardiovascular complications in chronic kidney disease patients. These findings suggest that IL-6 is associated with cardiac abnormalities. In the present study, since we did not measure the concentration of IL-6 in the blood, its changes could not be reported. CRP, which is produced by IL-6, was similar between the groups and was low. IL-6 and CRP have been reported to correlate . Thus, we consider that IL-6 levels were low in both groups. This study has several limitations. The patients with dialysis-related amyloidosis who were permitted to use the HICB column by Japanese health insurance were assigned to the HICBs group. Originally, the HICB column was used for adsorption of β2-MG. Thus, the β2-MG levels were not similar between the groups. Furthermore, differences in the dialysis treatment conditions were not considered among the study patients. These characteristics of our study population might have influenced the effect of HICB columns on the BMIPP SPECT images. In the present study, we were unable to explain why the first BMIPP SS in the HICBs group already treated with HICBs was high. Additionally, we were unable to clarify the findings because the ultrasound cardiography findings were not obtained at the same time as the BMIPP SPECT was performed. Since this study was a retrospective study with a small sample size, a larger multicenter, double-blinded trial is needed to clarify the clinical efficacy of HICBs in improving myocardial fatty acid metabolisms in this population. In this study, since the blood levels of PBUTs and IL-6 were not measured, it was not clear whether these concentrations would have been different between the two groups. Therefore, we were unable to conclude that the HICB columns improved the myocardial microcirculation. However, we suggested that long-term use of direct hemoperfusion with HICB columns improved the impaired myocardial fatty acid imaging in hemodialysis patients. Based on the results of previous studies, we believe that improving myocardial fatty acid metabolism imaging could improve the impaired myocardial microcirculation through the removal of protein-bound toxins and inflammatory cytokines. Our data indicate that the long-term use of an HICB column likely improved the impaired myocardial fatty acid imaging in hemodialysis patients. Further studies are needed to further elucidate the mechanism responsible. The datasets from the current study are available from the corresponding author upon request. NS and MN designed the study. NS performed the statistical analysis and wrote the manuscript. All other authors contributed to the study design, data collection, analysis, and writing of the manuscript. All authors read and approved the final manuscript. The Ethics Committee for Human Research of Toujinkai Hospital approved this study [2018-05]. We did not explain the study to each patient because this study was a retrospective epidemiological study. We used the patient's medical record only. The participants’ information \was anonymized, so that individuals could not be identified from the medical records. The study was performed in accordance with the principles of the declaration of Helsinki.